Explore your interests and make meaningful change with undergraduate research. For a growing number of Michigan State University students, undergraduate research is a defining experience in their college careers. Hands-on research makes them better learners and critical thinkers. It allows them to apply new knowledge to their studies and helps them map paths to graduation and beyond. MSU offers hundreds of individual and group-based research and creative activity opportunities. Attending a Big Ten university with an international reputation for ground-breaking research is a great advantage. The learning experiences are endless. Groundbreaking research and creative projects exist in every college at MSU. They offer a unique opportunities for faculty-student collaboration on a deeply academic level while allowing students to experience learning in exciting new ways. Become engaged in your education through undergraduate research. Want to know more about life as a graduate student? Attend this free networking lunch to learn more from current MSU graduate student. Event registration coming soon! Environmental Biology/Zoology sophomore, Ally Brown will have her undergraduate research story featured on the Council on Undergraduate Reseach website. 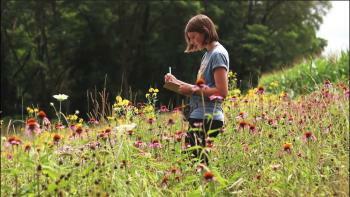 Ally's story will highlight her experiences at Kellogg Biological Station last summer. Jeremy '18 was selected to be the MSU campus ambassador for NASA Develop!